I promise to use it only to send you Newsletters. 2010 Audi R8 V10 - R-Tonic. This sporting car is not a demo car or a used car, Its a brand new car. 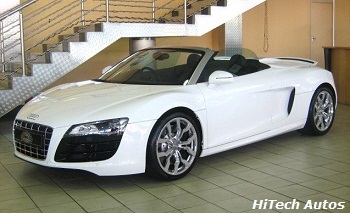 Come visit our showroom in Randburg to see this ultimate spyder. Ready to buy or sell a car, but don’t see the motor vehicle you want? No problem! Just fill out this form and we will find just the vehicle you’re looking for! Its lightweight material top opens along with closes totally mechanically; more than a few body pieces are made of a carbon fiber composite material. Insurance companies cover you and your travelers in the incident of an accident. But it is up to you to choose the level of general car cover you will get. Ready to buy or sell a car?, look no further! We are Hi-Tech Autos. Our honesty and reliability in the auto industry have earned the trust of our customers and our suppliers. About Us - We have earned the trust of our suppliers and customers. When it comes to buying and selling vehicles, we deal with our customers in an honest and upright manner. Hunting For demo cars for sale? We provide a wide range of pre-owned, as well as new vehicle's. In addition to our existing inventory, we can also locate you favorite "pre owned vehicle. Draw cars in 3D persepective following our clearly marked steps. Chassis No. B. 23BN. Motor No. K 43Q. U.K. Reg. No. TJ 8722. 1974 James C. Leake Auction catalogue picture..
Design by Oxborrow and Fuller. Has had six British owners before being exported to U.S.A. in 1969. Original owner kept car till 1946.